In-situ dual phase X Li4Ti5O12/(1-x) of LTO: TO due to varying heat treatments of the same dried gel with Li:Ti=4.5:6. Composites of LTO with TiO2 showed reduced band gaps and predicted increased electronic conductivity of the samples for enhanced electrochemical performance as anodes of Li-ion batteries. XPS showed that in both LTO and LTO/TO nano-composites, Ti cations are in the oxidation state of 4+, indicating the charge neutrality and suitability for oxidation/ reduction reactions during Li-ion intercalation/de-intercalation. Li4Ti5O12 (LTO) anodes are being proposed as alternative to widely used graphite-based anodes in commercial lithium-ion batteries for electric vehicles and energy storage systems as the latter ones suffer from dendritic growth of lithium on the anode surface at high current density because of their low lithium insertion potentials of 0.1V posing the risks of short circuits [1-3]. In electrode materials, Lattice strains are the main reason for capacity fading over cycling. Li4Ti5O12 bears good cyclability as it maintains a stable structure (zero strain) during electrochemical cycling with a negligible change in the unit cell volume during Li intercalation and de-intercalation [4,5]. LTO systems do not suffer from Solid Electrolyte Interface (SEI) formation owing to their high operating potential of 1.55 V as compared to reduction potentials of common electrolytes, which makes it suitable for high rate operations [1,6,7] but still the rate performance is limited by their low electronic conductivity which hinders its commercialization . However, intensive research is being carried out to improve the conductivity by using suitable dopants 3 i.e Zn, Sr, V, Al, La etc. [9-13], modifying the surface morphologies [6,14,15], particle size reduction and making composites with metals or metal oxides like LTO-Au, LTO-Ag, LTO-CNTs, LTO-Cu, LiF/Ti, Fe/Li3PO4, LTO-Li2TIO3, LTO-Li2Ti3O7. Composites of compounds ie polycrystalline materials provide enhanced grain boundaries in the phase interfacial areas hence increasing the lithium storage as compared to the bulk LTO. Enriched grain boundaries in dual phase materials provide a large number of diffusion mediating defects which causes fast diffusivity hence increasing the rate performance. These dual phase materials introduce interfacial pseudo capacitive effects due to abundant phase interfaces. The pseudo capacitive effects provide fast lithium insertion extraction and additional electrochemical lithium storage at the interfacial sites hence improving the high rate capability and cycle stability. Various synthesis reports of LTO revealed that Li4Ti5O12 generally comprises of an extra phase of TiO2 which can only be removed after long hours annealing at high temperatures. This causes aggregation of particles making large area inactive for electrochemical reactions. Various methods that have reported TiO2 free Li4Ti5O12 Phase are not feasible for commercial scale production of the material. Interestingly, TiO2 (Anatase) itself has a high electrochemical activity with a theoretical capacity of 330mAh which encourages the idea of optimization and utilization of dual phase of Li4Ti5O12TiO2 (Anatase or Rutile) instead of compromising on particle size in an attempt to remove it. Anatase-TiO2 has been reported to have fast lithium diffusion owing to its large lattice space along c-direction (9.51 A) as compared to Rutile-TiO2. Currently, many groups have examined the effects of TiO2 on the electrochemical behavior of LTO by synthesizing composites of LTO-Anatase TiO2 and LTO-Rutile TiO2. Besides, studies revealed that the second phase of TiO2 also plays a role in preventing particle aggregation and grain growth, due to competitive crystallization between the two phases and the steric hindrance effect. We have synthesized in-situ XLi4Ti5O12/(1-x) TiO2 (with x=0,30,40,60,70) nano-composites and pristine Li4Ti5O12 (LTO) by sol-gel method and thoroughly studied the structural and electrochemical performance of the prepared samples. Though sol-gel is a simple and commercial scale method that gives superior homogeneity owing to molecular scale mixing and good crystallinity, its limitation of yielding extra phases of TiO2 in Li4Ti5O12 systems particularly at low temperatures, proves helpful in the in-situ composite formation of Li4Ti5O12/TiO2 (LTO/TO). Literature reports that in-situ composites of compounds enhance the electrochemical reaction kinetics of the electrodes in Li-ion batteries, whereas, mechanical mixtures of LTO and TiO2 create high internal resistance in the cell due to increased charge transfer resistance within the particles. This work is devoted to the comparative study of XLi4Ti5O12/(1-x) TiO2 nano-composites ie with varying weight% of both Li4Ti5O12 and TiO2. The calculated amount of titanium butoxide was added in the mixture of ethanol absolute and acetic acid (mixture volume ratio of 75:25%), followed by stirring for 2.5 hours. Here acetic acid is a chelating agent which forms a homogeneous gel that gives rise to narrow particle size distribution and good dispersion after heat treatment. A weighed quantity of lithium acetate was dissolved in distilled water, added to the above-prepared mixture and stirred for 2.5 hours. To control the particle size to nanometers scale and prevent aggregation of particles polyvinyl alcohol (PVA) solution was added as a surfactant. 0.25 g of PVA was added in 20 ml distilled water and stirred vigorously at 80ºC to get a clear solution. This solution was added in the prepared gel and stirred. The resulting gel was dried at 120ºC to evaporate the organic solvents and heated at 350ºC in air atmosphere until PVA was decomposed and carbon content was burnt yielding white powder Table 1. The white powder with a molar ratio of Li:Ti=4.5:5 was calcined at 8000ºC for 5h to yielded pure Li4Ti5O12 powder. Powder with molar ratio Li:Ti=4.5:6 yielded 40% LTO/60%ATO on calcining at 600ºC/5hrs, 30%LTO/70%ATO at 600ºC/10hrs, 60%LTO/40%ATO at 700ºC/5hrs and 70% LTO/30% RTO at 800ºC/5 hrs. We can see that higher temperature synthesis (800ºC) of LTO/TO composites gives rise to the rutile phase of TiO2 instead of anatase. Table 1. Molar ratios of Li: Ti, heating temperature/time and crystallite size of the samples. The crystal structure of the samples obtained was characterized using powder X-Ray Diffraction (XRD) using a PANalytical X’Pert Pro MPD diffraction instrument with Cu Ka1 radiation (l=0.154056 nm) in the 2y range of 10 to 90 with a scan rate of 0.02°per minute. X-ray Photoelectron Spectroscopy (XPS) measurements were carried out using a Kratos XSAM 800 instrument with Al Ka X-ray radiation during XPS analysis. Scanning Electron Microscopy (SEM) was performed using a Jeol JSM-5910LV to examine the morphology of the samples. The chemical composition and phase formation of the samples was determined by Thermogravimetric Analysis (TGA). Diffused Reflectance Spectroscopy (DRS) was studied to estimate the variation in the electronic structures of the LTO/TO composites in comparison with pristine LTO. The electrochemical performance of the synthesized powder was evaluated by galvanostatic charge-discharge testing against lithium as a counter electrode. The electrode was prepared by a slurry coating procedure. The slurry was prepared by grinding and sonicating 80 wt% Li4Ti5O12, 10 wt % acetylene black and 10 wt% polyvinyl ideneflouride PVDF binder in N-methyl pyrrolidinone solvent. Binder was first dissolved in the solvent by magnetic stirring and heating at 80ºC. Lithium titanate was dispersed in N-methyl pyrrolidinone by ultra sonication. Binder solution was added slowly and the mixture was further sonicated to get a uniform slurry. This slurry was uniformly coated on copper foil current collector by brush coating. Several coats were applied to get 3 mg/cm2 loading. The electrodes were dried in vacuum oven at 100ºC for 12 hours. 2025 type coin cell was fabricated in argon-filled glove box using polyethylene as sea parator and 1M LiPF6 in Ethylene carbonate/Dimethyl carbonate (1:1) as elthe ectrolyte. The electrochemical charge-discharge tests of the samples were performed in the voltage range of 1.0-2.5 V Figure 1. Figure 1: XRD patterns of (a) Pristine LTO, (b) 40% Li4Ti5O12/60% ATO (c) 30% LTO/70% ATO (d) 60% LTO/40% ATO (e) 70% LTO/30% RTO. TGA of dried gel with Li:Ti molar ratio of 4.5:6 for LTO/TO composites and LTO/TO composite prepared at the minimum temperature/time of 600ºC /5h are shown in Figure 2a and 2b respectively. Initial weight loss of 13 wt% from 25ºC to 350ºC is due to evaporation of water and organic solvents used in the sol-gel synthesis. 22 wt% loss from 350ºC to 500ºC is attributed to burning of carbon content of decomposed PVA added for limiting the particle size. No significant weight loss appears on heating above 500ºC as stable phases of TiO2 and Li4Ti5O12 are formed indicating straightening of TGA curve. However, small weight loss of 4% gradually happened as heated to 850ºC resulting from the decomposition of Li2CO3. DSC curve shows exothermic peaks around 100-150ºC, 180ºC, and 300ºC owing to evaporation of water/ethanol, acetic acid and a carbon content from the gel. A wide endothermic peak appeared around 500º-800ºC which indicated the formation of in-situ LTO/TO phases Figure 3. Figure 2a: TGA/DSC curves of dried gel with Li:Ti molar ratio of 4.5:6 for LTO/TO composites. Figure 2a: TGA/DSC curves of LTO/TO composite prepared at the minimum temperature/time of 600ºC/5h. Figure 3: Band gaps of pristine LTO and LTO/TO composites. DRS of all the samples were studied and band gaps were calculated using Kubelka Munk function to estimate the variations in the electronic structures with the varying LTO/TO compositions. Both LTO and TO have a direct band gap. Band gap of pure LTO was found to be 3.5 eV showing an insulator like behavior (predicting poor electronic conductivity). All LTO/TO composites showed band gaps of both phases ie LTO at 3.1eV (insulator like) and TiO2 at 2.6 eV (conductor like behavior). Bandgap measurements predict that making composites of LTOs with TiO2 increases the electronic conductivity of LTOs which will enhance the electrochemical performance of anodes. Scanning electron micrographs Figure 4 shows average particle size less than 100 nm for pristine LTO (calcined at 800ºC/5h) and less 50 nm for LTO/TO composite (calcined at 600ºC/5h). This is consistent with the average crystallite sizes of the samples calculated from Scherrer’s formula, which suggests that PVA surfactant helped in preventing aggregation of particles and restricted the particle growth to less than 100 nm even at 800ºC. Figure 4: Scanning electron Micrographs of (a) pristine LTO (calcined at 800ºC/5h) and (b) LTO/TO composite (calcined at 600ºC/5h). 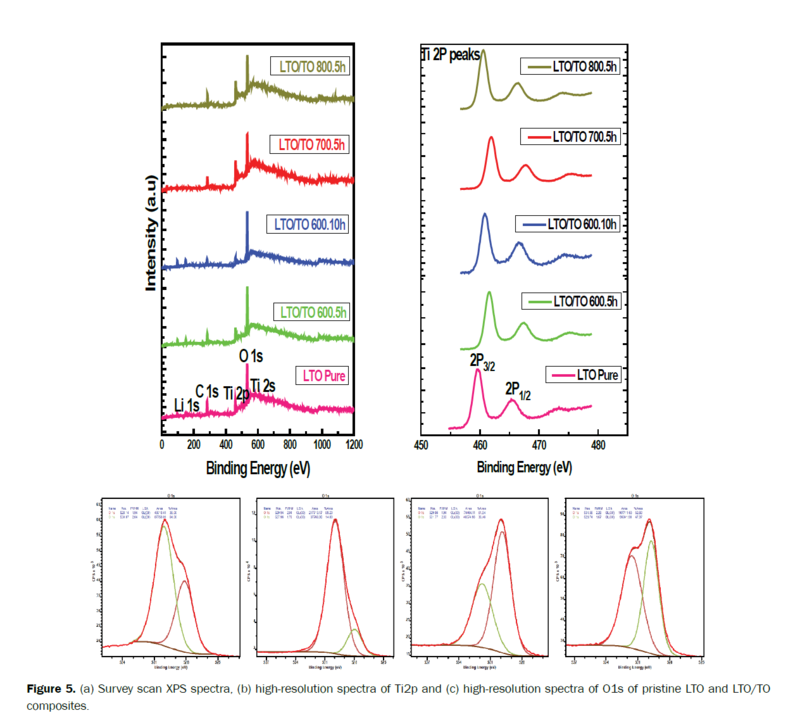 Figure 5: (a) Survey scan XPS spectra, (b) high-resolution spectra of Ti2p and (c) high-resolution spectra of O1s of pristine LTO and LTO/TO composites. Gaussian-Lorentzian mix function and Shirley background subtraction were employed to de-convolute the O1s spectra of the samples. O1s peaks at 530.2 eV were attributed to O2 associated with Ti-O bond in the synthesized materials. O1s peaks at 531.8 eV are linked to the O2 and H2O absorbed on the surface of the materials. In-situ dual phase XLi4Ti5O12/(1-x) TiO2 (with x=0,30,40,60,70) nano-composites and pristine Li4Ti5O12 were synthesized by sol-gel. TGA/DSC studies of dried uncalcined gel showed the formation of LTO/TO phases around 600ºC to 800ºC. Calcined powder at 600ºC/5h showed the structural stability of the LTO/TO phase at heat treatment of up to 800ºC. XRDs confirmed well crystalline phases of all the samples with varying wt%. of LTO:TO due to varying heat treatments of the same dried gel with Li:Ti=4.5:6. Composites of LTO with TiO2 showed reduced band gaps and predicted increased electronic conductivity of the samples for enhanced electrochemical performance as anodes of Li-ion batteries. XPS showed that in both LTO and LTO/TO nanocomposites, Ti cations are in the oxidation state of 4+, indicating the charge neutrality and suitability for oxidation/reduction reactions during Li-ion intercalation/de-intercalation. Hu X, et al. A high rate, high capacity and long life (LiMn2O4+Ac)/Li4Ti5O12 hybrid battery supercapacitor. J Power Sources. 2009;187:635-639. Ohzuku T, et al. Zero-strain insertion material of Li[Li1/3Ti5/3]O4 for rechargeable lithium cells. J Electrochem Soc. 1995;142:1431-1435. Devie A, et al. Overcharge study in Li4Ti5O12 based lithium-ion pouch cell: I. Quantitative diagnosis of degradation modes. J Electrochem Soc. 2015;162:1033-1040. Yang Z, et al. Nanostructures and lithium electrochemical reactivity of lithium titanites and titanium oxides: A review. J Power Sources. 2009;192:588-598. Sorensen E, et al. Three-dimensionally ordered macroporous Li4Ti5O12: Effect of wall structure on electrochemical properties. Chem Mater. 2006;18:482-489. Zhong Z, et al. Ab initio studies on Li4+xTi5O12 compounds as anode materials for lithium-ion batteries. Chem Phys Chem. 2008;9:2104-2108. Wagemaker M, et al. Li-Ion diffusion in the equilibrium nanomorphology of spinel Li4+xTi5O12. J Phys Chem. 2009;113:224-230. Cheng L, et al. Carbon-coated Li4Ti5O12 as a high rate electrode material for Li-ion intercalation. J Electrochem Soc. 2007;15:692-697. Yan H, et al. Colloidal crystal templated synthesis of ordered macroporous electrode materials for lithium secondary batteries. J Electrochem Soc. 2003;150:1102-1107. Chen J, et al. Synthesis of sawtooth-like Li4Ti5O12 nanosheets as anode materials for Li-ion batteries. Electrochim Acta. 2010;55:6596-6600. Tang Y, et al. Li4Ti5O12 hollow microspheres assembled by nanosheets as an anode material for high-rate Lithium-ion batteries. Electrochim Acta. 2009;54:6244-6249. Tang Y, et al. Preparation and electrochemical lithium storage of flower-like spinel Li4Ti5O12 Consisting of nanosheets. Electrochem Commun. 2008;10:1513-1516. Lin Y, et al. Facile synthesis of mesoporous lithium titanate spheres for high rate lithium-ion batteries. J Power Sources. 2011;196:10698-10703. Liu J, et al. Tiny Li4Ti5O12 nanoparticles embedded in carbon nanofibers as high capacity and long-life anode materials for both Li-Ion and Na ion batteries. Phys Chem Chem Phys. 2013;15:20813-20818. Borghols W, et al. Size effects in the Li4+xTi5O12 spinel. J Am Chem Soc. 2009;131:17786-17792.